As some of you know, I have Rosacea, I hate it, I can’t control it – and neither can the doctors it seems. They say there is no cure – but I do not believe it, the truth is , no real money has been put into finding a cure ..why..you ask ?? Because it affects “women 3X more than men “. I think this is the real reason. I am not joking. If the medical “profession” , can find a way ..to deal with “ limp daddy’s”, by inserting stuff , here and there, trying to enhance the size ..Regardless of the man’s age !! Then to have it covered by insurance! 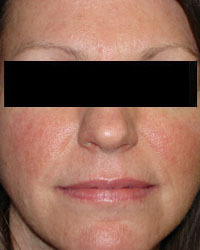 And treatment for a constant red and inflamed face – that feels like sunburn , is not covered ! The logical reason is obvious to me – MEN control the American medical system ..DON’T even get me started on Breast Cancer .. 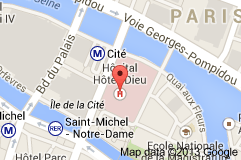 So I had my second doctor opinion in a Hospital for Dermatology – that was next to Notre Dame !! This hospital is over 400 years old, I still have a hard time thinking in terms of how long France has been around, when I compare it to America. The building was in very good condition for its age and clean . The waiting time for my appointment for Rosacea, was 8 weeks long. Now I know that seems long, but just like America ,private doctors are easy to see, but you have more of a ‘co –payment’. Using the Hospital , the co-payment is controlled by the govt..so if you want to save money, you do things this way. The payment was 35.00. When I went to the first doctor , it was 54.00. As for another ‘myth of France’s social medicine” .Once I checked in, my wait time to see the doctor was less than 30 minutes. She ( Dr. Lady – for privacy reasons)was very nice, a thin woman standing around 5’ 5. Brown hair with a couple of strands of grey hair near her temples. She meet me , wearing the normal hospital white doctor coat . She asked me why I was there, ( I think I said the word incorrect ) and of course she saw my face, and walked over to me, and bent down to take a closer look. The rosacea was very plan to see, but what happened next kinda shocked me. I was very lucky because she understood and spoke some English. Dr. Lady told me , that my face was inflamed and it was too late for me to get laser. My heart sank, I do not want to deal with this skin issue anymore, just kill the skin, right ? So instead, I am on this new treatment for the summer . I am now required to wear SPF 50 during the day, and must reapply it every 2 hours if I am out side for a long time. Also I am taking a drug called Effizinc, 2 pills after dinner , every night . Dr Lady also gave me Finacea pills & Uriage. She told me, we must be very aggressive with the treatment due to it getting worse, since my first visit with the other French doctor. She knew this fact, because, I have a book of “medical” visits , and in it , doctors write what the diagnosis is ,and recommended treatment. In September, I will start a new treatment from La Roche – but it requires monthly blood work ..I am not cool with needles. Its called ISOTRETINOIN. I think, it no longer is offered in American (?) I really can’t tell from the internet. So , lets recap this .. I have a skin disorder, that some how ?? is considered cosmetic in America , thus why it was allowed to get worse with years. Summer is finally in Paris, but I can’t stay outside in the sun , unless I apply this cream on my face – and it feels sticky all day. Once the summer is over, I can look forward to getting needles stuck in my arms – and dealing with my phobia about this. The skin is the largest organ in your body – I learned this, in science class ..BUT I guess – its not the organ that counts the most to the American male doctors ..
Did I miss something … ?